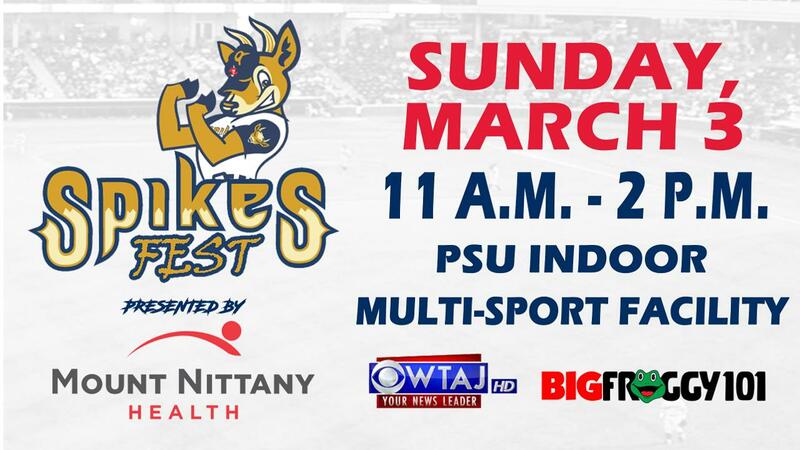 The State College Spikes will bring free, family fun to the Penn State Indoor Multi-Sport Facility with SpikesFest 2019, presented by Mount Nittany Health and media sponsors WTAJ and BIG Froggy 101, on Sunday, March 3 from 11 a.m. to 2 p.m. Admission for the Spikes' 14th annual indoor winter carnival is free for all fans. SpikesFest 2019 will feature activities designed to bring the summertime fun of a Spikes game indoors. Spikes mascots will be on hand to meet and greet fans, along with ballpark inflatables, batting cages, kids games and live entertainment. In addition, Mount Nittany Health, along with an array of other local community groups and organizations, will be presenting fun activities and information to fans of all ages. Get all of the information on SpikesFest 2019 at SpikesFest.com! SpikesFest 2019 will also feature a silent auction of sports memorabilia and entertainment experiences with all proceeds to benefit the Mount Nittany Health Foundation. The auction will feature a number of affordable items, as well as unique collectibles from across the sports landscape. A full list of items up for bids will be available at SpikesFest.com prior to the auction. "We are excited to once again partner with a great organization in Mount Nittany Health to provide families with a fun, free way to beat the wintertime blues at SpikesFest," said Spikes General Manager Scott Walker. "We look forward to seeing everyone get ready for Spikes season inside the Penn State Indoor Multi-Sport Facility." The Penn State Indoor Multi-Sport Facility is located across from the Bryce Jordan Center on the Penn State campus. Parking will be available in Lot 44, adjacent to the Multi-Sport Facility. A complete list of SpikesFest activities will be available on SpikesFest.com once finalized. Fans attending SpikesFest will also be afforded the opportunity to purchase ticket packages for all 38 home dates on the Spikes' 2019 schedule. The Spikes' home slate begins with Opening Night at Medlar Field at Lubrano Park against the rival Williamsport Crosscutters (Philadelphia Phillies), and runs through September 1. Season seat memberships, Flex Books, Value Plans and an array of group and hospitality options for the 2019 season are currently on sale by calling the Spikes at (814) 272-1711. Additional information on all club ticketing options, as well as team news and schedule info, can be viewed at StateCollegeSpikes.com.